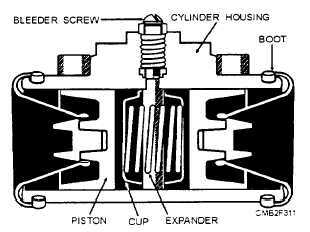 cylinder consists of a cylinder or housing, expander spring, rubber cups, pistons, dust boots, and bleeder screw (fig. 7-10). The wheel cylinder housing encloses all the other parts of the assembly. It has a precision cylinder in it for the pistons, cups, and spring. The expander spring assists in holding the rubber cups against the pistons when the assembly is NOT pressurized. Sometimes the end of the springs has metal expanders (cup expanders) that help to press the outer edges of the cups against the wall of the wheel cylinder. The wheel cylinder cups are special rubber seals that keeps fluid from leaking past the pistons. They fit in the cylinder and against the pistons. The wheel cylinder pistons transfer force out of the wheel cylinder. These metal or plastic plungers act on pushrods that are connected to or directly on the brake shoes. The dust boots keep road dirt and water from entering the cylinder. They snap into grooves that are cast on the outside of the housing. The bleeder screw provides a means of removing air from the brake system. It threads into a hole in the back of the wheel cylinder. When the screw is loosened, hydraulic pressure is used to force air and fluid out of the system. BRAKE SHOES. - Brake shoes are used to support, strengthen, and move the brake lining. Because the brake lining material is soft and brittle, it is necessary to add a supportive foundation to the lining so it will not collapse and break during use. The brake shoes also serve to attach the brake lining to a stationary unit. usually the backing plate. so braking action can be accomplished. Figure 7-10. - Cross section of a wheel cylinder. Brake shoes are made of malleable iron, cast steel, drop forged steel, pressed steel, or cast aluminum. Pressed steel is the most common because it is cheaper to produce in large quantities. Steel shoes expand at about the same rate as the drum when heat is generated by braking application, thereby maintaining the correct clearance between the brake drum and brake shoe under most conditions. Automotive brake shoes consist of a primary and secondary shoe. The primary brake shoe is the front shoe and normally has a slightly shorter lining than the secondary shoe. The secondary shoe is the rear shoe and has the largest lining surface area. Variation in brake design and operating conditions makes it necessary to have different types of brake linings. Brake linings come in woven and molded form (fig. 7-11). The molded form is currently used on modern vehicles. Molded brake lining is made of dense, compact, asbestos fibers, sometimes impregnated with fine copper wire, and cut into sizes to match the brake shoe. Depending on how much metal fiber is used in their construction determines how they are classified, either as nonmetallic, semimetallic, and metallic linings. Nonmetallic linings contain very few metal fibers. This type of lining is used on many vehicles because of its quiet operation and good heat transfer qualities. Because of the lack of metal particles, the nonmetallic linings wear well with brake drums and do not tend to wear the drum excessively. Semimetallic linings have some metal particles in their composition. They also have good wearing properties and are quiet during application. Metallic linings have a high degree of metal fiber in their construction and are generally characterized by small pads bonded or welded to the brake shoe. The pads may have a small space between them to aid in cooling. The metallic linings operate at high temperatures and may require the use of special high-temperature brake parts. Metallic brake linings are generally used for heavy-duty brake application where large loads must be stopped or brakes are applied often. Brake lining is riveted or bonded to the face of the brake shoe. Semitubular brass rivets are used to attach the lining to the shoe. Brass rivets are chosen over other types because brass does not score the brake drums excessively if the lining should be neglected and worn past the point of replacement.